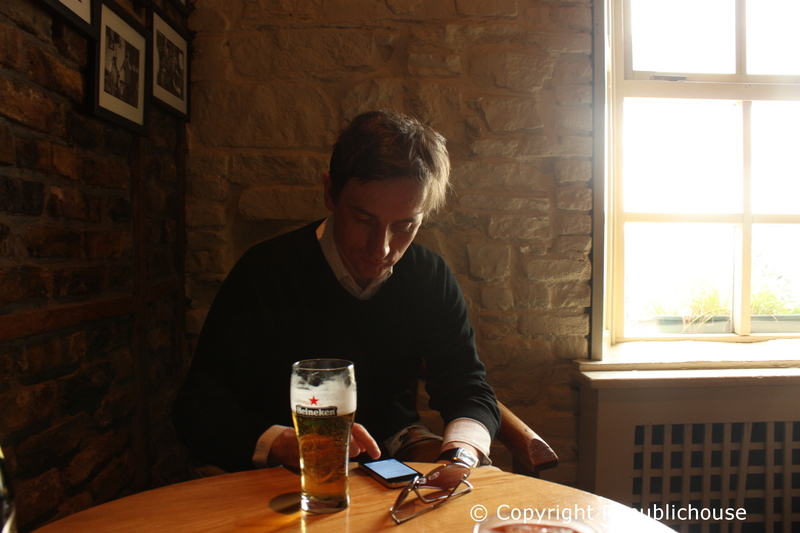 There can be few sweeter, simpler pleasures than to sit perched outside ‘The Bulman’ pub sipping a crisp pint on a sunny day. Located by the pier at gorgeous Summercove Bay, The Bulman affords you great views across to the picturesque town of Kinsale, County Cork. Such was our good fortune on this particular Spring day earlier this year, when we found ourselves in just such an enviable position. 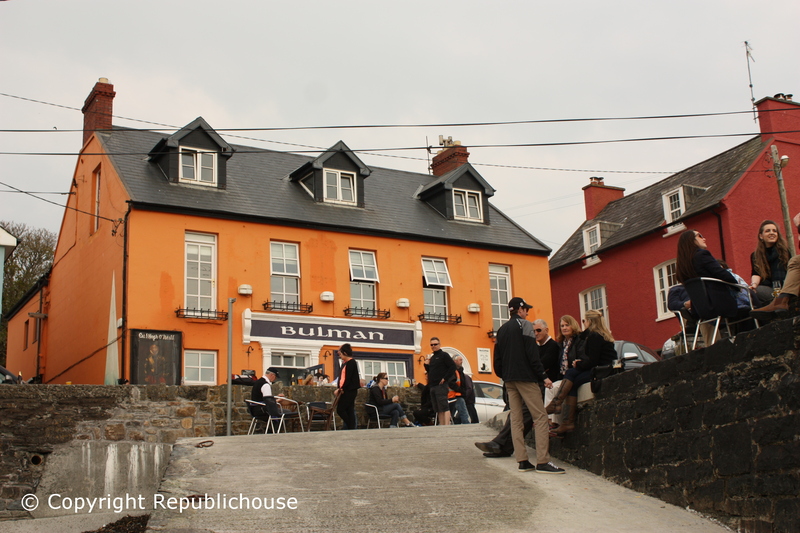 We parked up by nearby Charles Fort and sauntered back down the hill towards the inviting sight of the pub’s colourful exterior. The sun was out and accordingly there was a lively crowd gathered out front, lapping up both the sunshine and the free-flowing drinks. Amid such fun and revelry, it’s hard to imagine that this was once the scene of one of the most significant maritime battles in the history of Ireland. 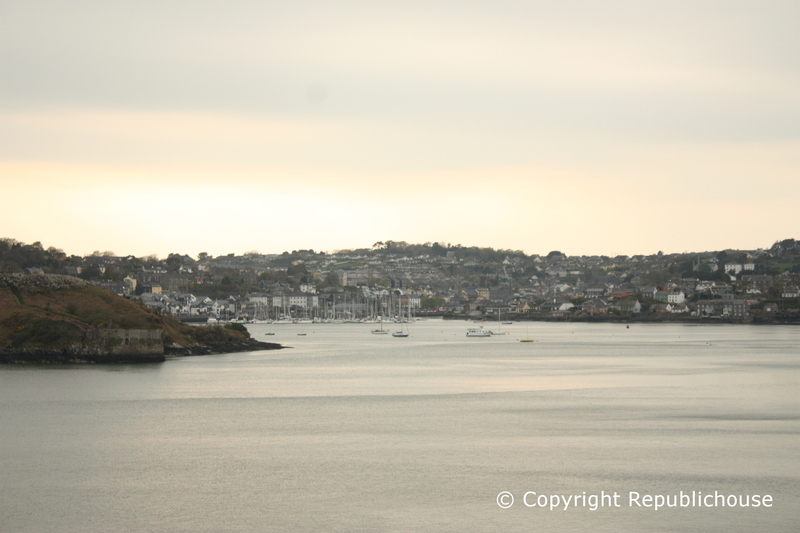 In late 1601, four thousand Spaniards docked their fleet of ships at nearby Kinsale, in readiness to combine forces with the Ulster Chieftains O’Neill and O’Donnell to fight against the settled English army. Alas on arrival, given their poor grasp of geography, they were about as far away from their Ulster compatriots as they could possibly have been. 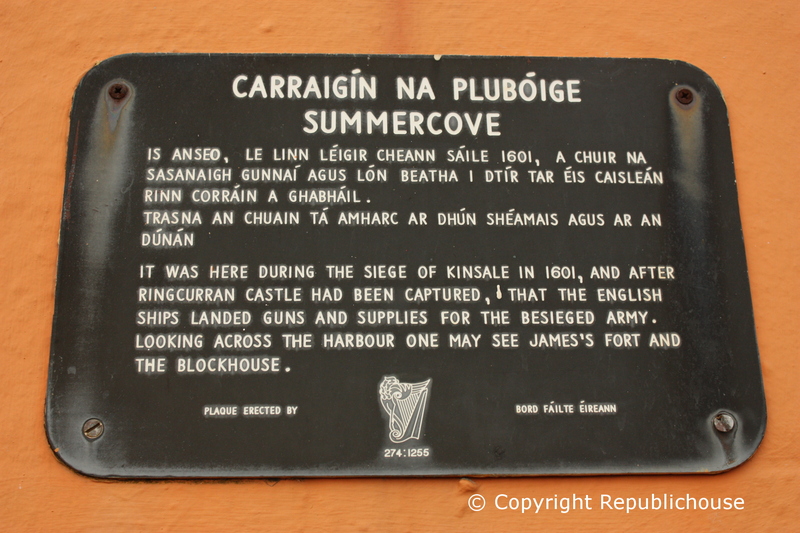 Ultimately they ended up surrounded by the English, who laid siege on Kinsale, and emerged victorious after a bloody battle. The Ulster chieftains did eventually arrive to join the Spanish in battle but all too late and to no avail, in what spelled their demise and, in truth, the demise of a Gaelic Ireland. 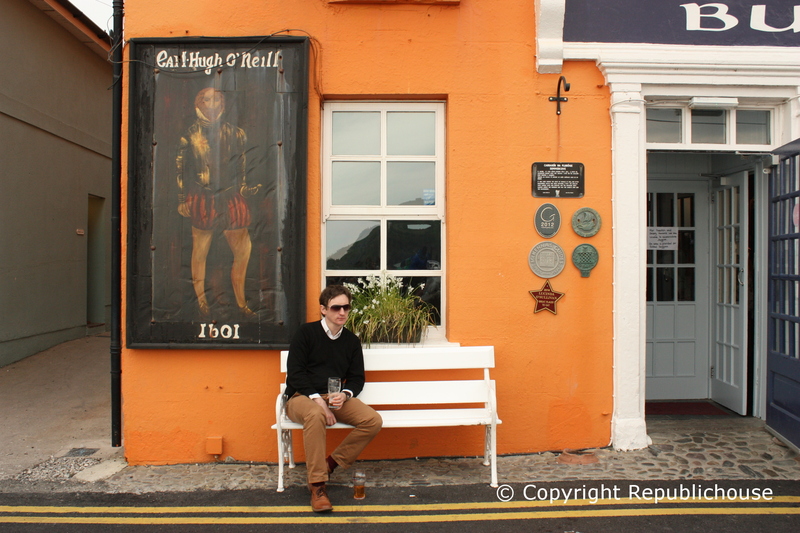 Today both Captain Hugh O’Neill and Don Juan d’Aquila – the Spanish commander in those final fateful days in 1601 – are honourably remembered by tasteful, painted portraits on either corner of The Bulman’s orange frontage. 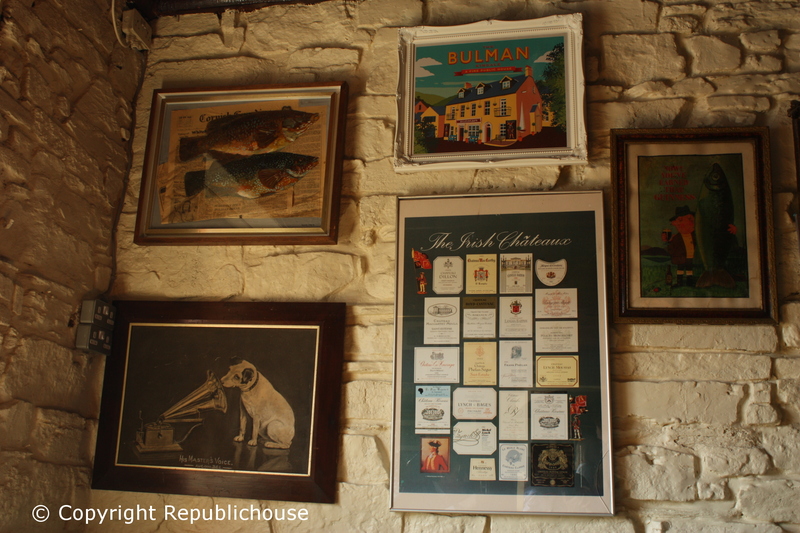 When we first entered The Bulman, it was evident that this was a pub steeped in maritime tradition, not least due to the old oars and dolphin-shaped wooden carvings hanging from the ceiling! Model ships, lifeboat charity collection boxes and black & white photos of bygone seafaring people, enhanced the nautical feeling. 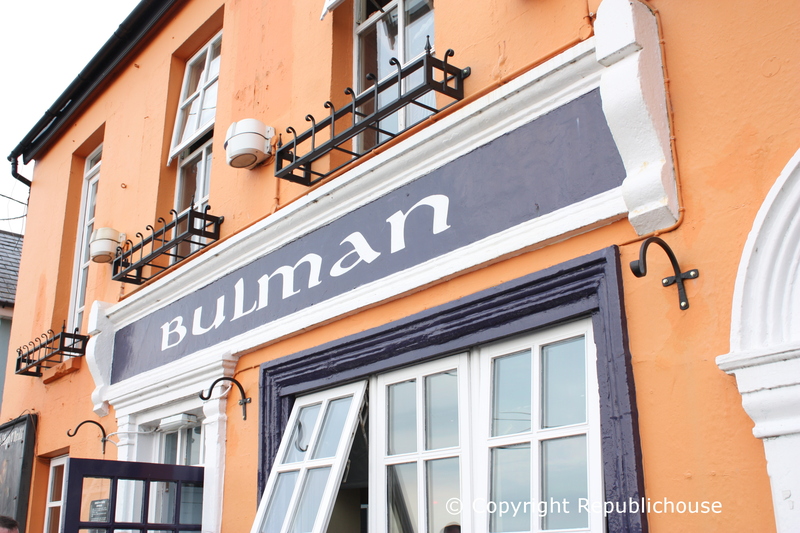 The Bulman is so named after the ‘Bulman Buoy’, a nearby landmark which indicates a safe route into Kinsale Harbour, and which itself was named after ‘The Bulman’ merchant ship, long lost at sea. Nearby Kinsale acted as the headquarters for co-ordinating rescue efforts when the LMS Lusitania was sunk by a German U-boat off the Irish coast in 1915. The nautical heritage in these parts runs deep, and ‘The Bulman’ continues to reflect that. The most telling contribution to the pub’s maritime ambience is of course the view out to the waters of Summercove. The pub even has its own charming little pier, right on its doorstep. All this is nicely detailed by grey slate floors, brass foot-rails along a pine bar counter, exposed stone walls, old clocks, hanging lanterns, antique mirrors and various pictures of historical note. 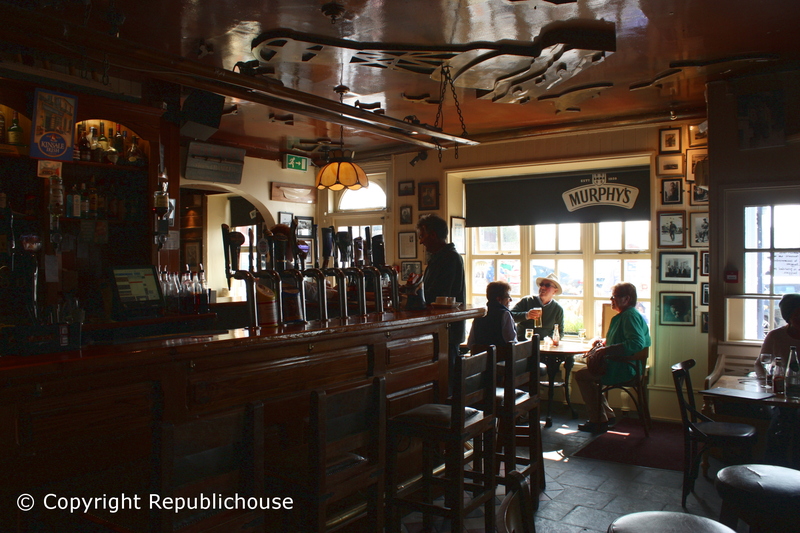 Images hanging on the walls include a commemoration of 150 years of Murphy’s Irish Stout (1850-2000) and a collection of ‘The Irish Chateaux’ (an account of various Irish involvement in notable French wines). Other imagery includes a Lifebuoy soap advertisement, nautical maps and countless photos of fishermen & musicians. It really is a lovely place to relax over a drink and watch the world go by. We were fortunate to grab a couple of stools by a high table in a cosy corner on arriving to The Bulman, given that it was as busy as you’d expect on a sunny weekend afternoon. The first pint of lager and glass of wine set us up nicely but what really added to our visit was the decision to grab a spot of lunch. One Thai Green Chicken Curry with Jasmine Rice and Gnocci with asparagus & sun-dried tomatoes later, we were suitably sated and headed back outside for some sun-laden drinks to conclude the afternoon. 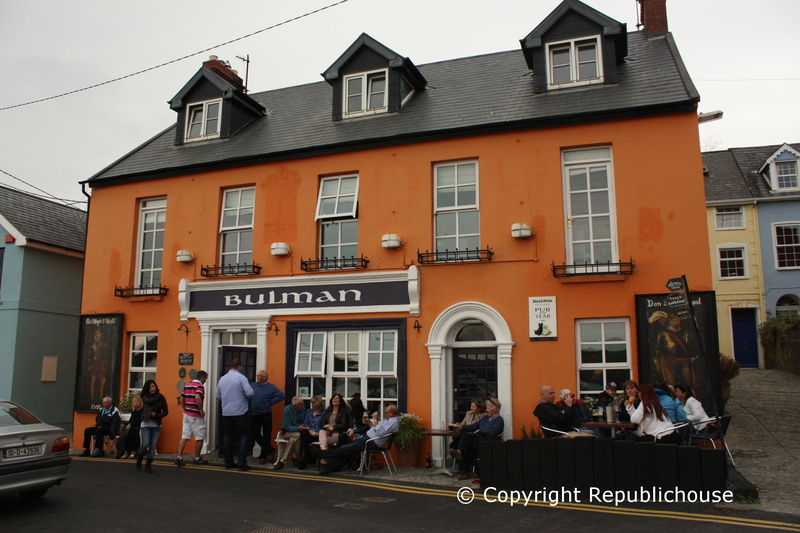 The food was delicious, which was no surprise given that The Bulman has been accredited by numerous bodies for its fine cuisine, including Georgina Campbell 2012, McKenna’s Guides 2013, and Lucinda O’Sullivan Great Places to Eat 2014. The bar menu suited us perfectly on the day, but ‘Toddies Restaurant’ housed in the upstairs floor, is equally a big reason why The Bulman has won all these awards. 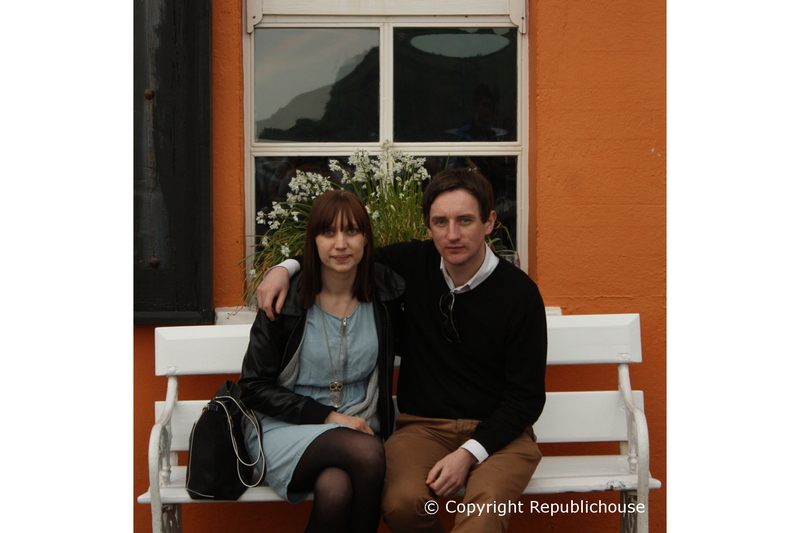 Our only regret was that we were limited to a daytrip on this occasion, as we were returning to Clonakilty later in the day. As the evening crept in and we enjoyed our final drinks outside in idyllic surroundings, we knew that The Bulman’s rarest delight may be to look across the water towards shimmering Kinsale by nightfall, sitting by the log-fire, whilst the place is lightly brimmed with locals, the fair weather punters long since gone. We can only speculate in that regard but the prospect is sure to bring us back for a lengthier visit, some time in the not too distant future. We eventually secured prime seating outside! Visit because: As coastal drinks go, few pubs can match The Bulman, situated by its own short pier, with views to the Atlantic Ocean, and oozing nautical charm throughout. Winter drinks by one of the two fireplaces are likely to be especially delightful as you keep suitably warm, peering out across the bay. If the weather turns bad, you don’t need to worry about getting stranded either as there’s a fine menu to keep you well fed! Food served? (Yes/No): Yes, there is an excellent bar menu, including Skewered Chicken, Seafood Chowder or Burger & Chips, amongst other options, and in fact, The Bulman includes an award-winning restaurant, known as ‘Toddies’. Check out the daily ‘Grilled Wild Fisherman’s Catch’!